They�re back, and that�s good news for us bird hunters. It�s been awhile since grouse hunting enthusiasts have had much to be excited about but frankly; it�s time to get wound up a little. Grouse haven�t been around in enough numbers to make the sport fun, and when its good it�s as much fun as you can have. The bottom of their cycle has drug on for what has seemed to be an eternity but things have definitely turned around. 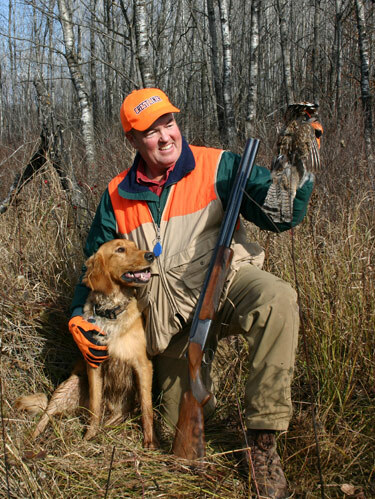 Last season�s action provided an indication that the numbers have improved and made it a lot easier to load the dog in the kennel and make the drive to get to some good grouse habitat. It�s hard to get up the gumption to tromp through miles of woods knowing full well you have little chance of flushing a bird or two. But that was then and this is now. Now, you can head out and know you will see at least a few birds, and maybe quite a few more. comeback a few years ago and there were some birds to chase around, but cold wet weather the following spring put a damper on success of the hatch and delayed their triumphant return. It looked like it might happen again last spring but things apparently turned around just in the nick of time as hunters were running into good numbers of young birds. The author expects more than enough grouse to make the fall season fun. Even though the counts are up they�re not everywhere, and nowhere near a peak. What that means is you�re still going to have to do some legwork to flush your share of birds. Your can increase your odds by being in the right place at the right time which includes plenty of logging roads. White clover and wild strawberry grows in abundance on logging roads and the real reason for grouse being attracted to them. Last year the roads were g ood a nd held most of the birds that my hound and I were able to flush. A lot of hunters will hit the trails early in the morning and give it up by late afternoon, but they could be missing out. Grouse will move back to the trails to feed again late in the day, and that could be the best time to be in the woods. Trails that had previously been hunted can s till be productive when the birds make th eir evening feeding move. Logging roads are a likely place to get things started but if the going is slow the birds might be keying on another food source like Snowberries and Rosehips. When you do venture away from the trails one of the keys to finding concentrations of birds is to look for changes in terrain like the bottom of a ridge, or along the edge of a slough. Another hot spot is where clear cut areas meet up with the old forest. Time of day also has an effect on where grouse can be found. For example; grouse really don�t like to get wet and the sunny side of a ridge or hill will be drier early in the morning. Another consideration is pressure, and if you�re dealing with a lot of it you may have to get off the trails and look for birds that have been moved. That means heavy cover and digging in, but if that�s the only option you might as w ell take it. If you�re going to get off the beaten trail (and even if you�re not) make sure you�re prepared and bring a compass along, and maybe a handheld G.P.S. The feeling of being lost is no fun at all, can be deadly, and it doesn�t have to happen. There�s more than one way to hunt grouse and a lot of hunters are doing it on AT Vs. But that�s not the way I prefer to do it. My preference is to do it on foot, with a dog. The four wheeler brigade will shoot their share of birds but they�re missing out on the fun o f watching a good dog get hot, make the flush, and hopefully a retrieve. They also miss birds that are just off the trail hiding in the thickest cover where it takes a dog with a good nose to root them out. Everybody has something they really and truly love to do, and for yours truly this is it. Give me and Annabelle a logging trail that goes on for miles and a nice crisp sunny fall day and I�m in heaven. Now if I could just hit a few more.